Having enjoyed breakfast at Dennys in Koenji so much the other day we decided to return again. Over breakfast we formulated a plan to visit two unusual buildings in Tokyo, the first one was to be found on the outskirts in Mitaka. About a 40 minute walk from the station in Mitaka we caught our first glimpse of The Reversible Destiny Lofts. The Reversible Destiny Lofts were completed in 2005 and although we knew very little about them we fell in love with them straight away. We'd love to live somewhere like this! As I'm writing this I looked up the history of these buildings, built in memory of Helen Keller apparently. If you want to find out more it's all here on the official website. We travelled back into the heart of Tokyo to see the next building, Nakagin Capsule Tower. Completed in 1972 and located in Shimbashi it was the world's first example of capsule architecture. Although still a stunning building it's clear to see as you take a closer look that it's in serious need of restoration. Each capsule could be replaced but due to asbestos and the huge cost of the work involved the tower has fallen into disrepair. Wires now hang from the tower and there's netting covering the entire structure, apparently many of the owners would rather see the tower demolished and reap the profits of a brand new apartment building. I loved the tower though and would love to see it restored to its former glory. From Shimbashi we decided to catch a train back to Koenji for some lunch. These markings are found on platforms in Japanese train stations, they inform passengers where to queue and also tell you the exact spot to wait at for the correct carriage number of the train. Back in Koenji we returned to a restaurant that we had attempted to eat at a few times, it had always usually been closed. On this occasion it was actually open though, I'd finally get to try those large battered prawns on a bed of cabbage! Inside it was a feast for the eyes with no end of trinkets and souvenirs covering every possible surface. We took a seat by the counter and tried to take it all in. The owners of this small restaurant were an elderly couple, the wife was super flamboyant with orange and red hair. They spoke little English and we knew very little Japanese, even my wife's handwritten "I am vegetarian" note from Bom didn't seem to help here. The problem was that they had a set menu and it all included meat or fish. My wife insisted she wouldn't have anything so I ordered the prawn dish thinking maybe I could share the non meat items with her. We tried to order some beer and the owner rushed over pointing at our glasses of water saying "Water, Water", Maybe they didn't serve alcohol we thought? When the prawns arrived they looked just has they had in the window display, deep fried in batter and served on a bed of shredded cabbage. The lady brought another bowl over for my wife and indicated that it was ok to share, everything else on the plate was vegetarian so this was a big relief as I hate eating on my own. Next some miso soup and rice covered in sesame seeds arrived, all the food here was really good and there was plenty enough for two of us. This set meal cost ¥900 (about £6.60) so definitely worth the money. These caramelised onions with sesame seeds arrived, delicious with the rice! It was nice to finally eat at this small restaurant that I'd had my eye on for so long now, it was certainly an experience and the old couple running it had heaps of character. After lunch we travelled one stop on the Chuo line to nearby Nakano. In Nakano Sun Mall was a cafe called Bar Zingaro created by Takashi Murakami. My wife's a big fan of his work so we went in search of the cafe in this very 1990's looking Mall. This area is known as Zingaro Space, it was covered with Takashi Murakami's happy flower design. To buy some of Takashi Murakami's work check out this page. Towards the rear you could by merchandise, there didn't seem to be anywhere to order a drink though. We sat down and studied a menu and eventually another customer pointed out a bar around the corner where you ordered food and drink. Bar Zingaro sold drinks, biscuits, light snacks, books and badges, it also had an impressive shaved ice menu. We ordered a coffee and one of these colourful happy flower biscuits. We returned to Zingaro space and fitted right in with the surroundings. Nakano Sun Mall is also an otaku haven with many floors of shops selling no end of anime and Manga as well as vintage collectibles and train sets. If it was collectible then it could be found in Nakano Sun Mall, everything from the iconic Milky girl and Blythe dolls to film memorabillia and Ronald McDonald could be seen in the many window displays here. The chap running this small collectibles shop had certainly made good use of his space, there were so many things in here. The first few floors of Sun Mall have really low ceilings as they were originally intended to be used as apartment space. Up on the top floor though the ceilings are much higher and artificial clouds are painted onto the ceiling tiles. This vintage cigarette counter could be found on the top floor. Before leaving we checked out the basement of the mall which had a supermarket and some food stalls. I was tempted by this impressive rainbow tower cone ice cream from Daily Chiko, I just wasn't feeling hungry enough though. Before leaving Nakano we stopped for a nice cold pint of Kirin, a small vegetable snack arrived with the beer. We had considered ordering some food here but there was somewhere we wanted to visit for dinner tonight for one last time, Hanbey. Hanbey's main restaurant was in Shinjuku, time to enjoy the Hanbey experience one last time! This was our last night in Tokyo as tomorrow night we would be staying at a hotel in Narita Airport. The Shinjuku branch of Hanbey had a similar decor as the other one we'd visited in Nagasaki, this one was much bigger though. The cabbage arrived with the beers, we couldn't get enough of that dark and delicious dipping sauce. This place had a bell on the table meaning you could order things much quicker enabling us to make the most of our 2 hour time slot here. My wife had really missed tomatoes since being in Japan so wasted no time in ordering some as her first dish. Tomatoes here cost the same price as fried chicken which was quite a surprise, even in supermarkets tomatoes seemed to be quite expensive in Japan. The fried chicken in Hanbey is so good I just had to order some. Next my wife ordered some tofu, 2 huge chunks arrived topped in vegetables, delicious! No trip to Hanbey is complete without trying their ¥200 (about £1.45) okonomiyaki, stunning everytime and such a bargain! The secret of Akkochan was the only original Hanbey cocktail we hadn't tried yet so we ordered it. I forget what the cocktail contained but it tasted really nice and came with some rather fetching flashing LED rubber rings. We finished off with this drink, I forget what it was now but it certainly looked the part. If you tell the staff at Hanbey that it's your birthday then they generally do something special to mark the occasion. 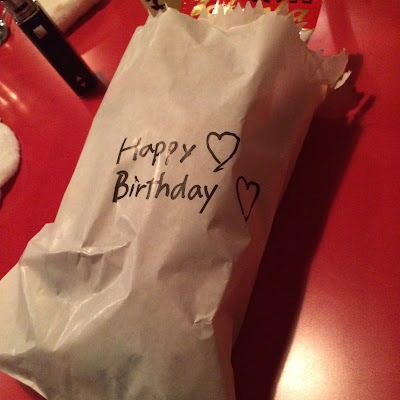 My birthday was a few days ago now but they didn't know that, my wife dropped the hint it was today and this bag arrived at the table. 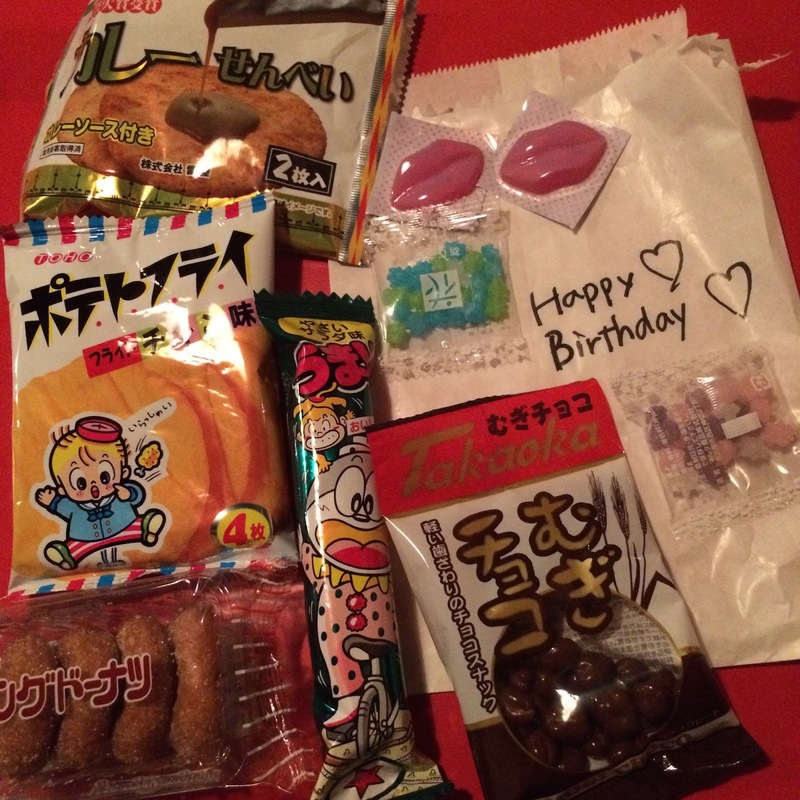 It was stuffed with a selection of snacks and sweets, nice! On our final visit to Hanbey we also noticed that the price beside soup and ice cream is ¥0, we ordered some ice cream right away! After leaving Hanbey we walked around Shinjuku, this place looks so impressive once it's dark, neon signs everywhere. Something to always be mindful of in Japan is just how many different bars, shops and restaurants are to be found on the floors above ground level. There's a whole new world of places to discover if you take your time to explore the different floors of each building. Back at the hotel I raised a Suntory Highball to our last night in this incredible city. 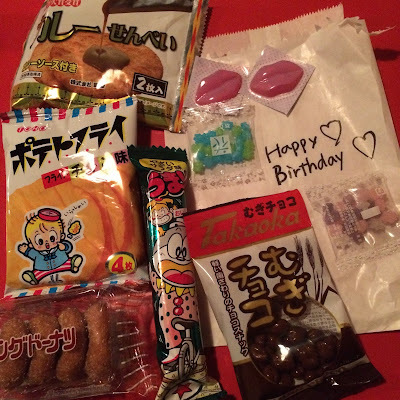 We tried some of the things in the goodie bag from Hanbey. Mugi Choco D were rather tasty wheat puffs coated in chocolate. These dinky donughts looked really nice on the outside, a bit inside dry though. This tasty pair of giant crisps came with a sachet of soy sauce. I distinctly remember seeing how long these would stick on my lips for. Fart pant crisps were amazing!! Our final snack was this giant wotsit type stick, very nice indeed but make sure you have a drink nearby, your dry mouth will thank you for it! The Reversible Lofts were where Shoshanna in GIRLS on HBO lived while she was in Tokyo. Maybe I'll stop by next time I go. I'm going to use your recent trip as a starting point. I'd like to go back to the mountains too, but definitely need to hit Kyoto again and the coast more. Still can't find 7/11 pocket salmon in the states.